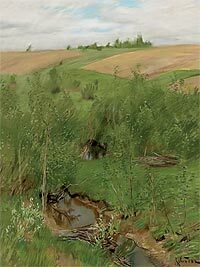 "Levitan's landscape" is a term firmly ingrained both in art scholarship and in the minds of many art lovers. A "Levitan landscape" is different from an "Ivan Shishkin landscape" or even landscapes by Alexei Savrasov or Vasily Polenov, although it is very close to the last ones. 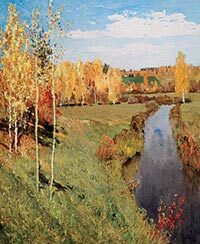 Usually, a "Levitan landscape" is a simple image of an almost always deserted natural environment - a creek, a narrow pathway, groves rolling on into the depth of the picture in a somewhat diagonal direction, or copses. It is set in different seasons, except (largely) winter -Levitan's pieces almost never feature images of snowy winter -and usually depicts a transitional season or summer; there are blue horizons and a high limitless sky with a distinct life of its own, beyond the mental grasp of human beings. 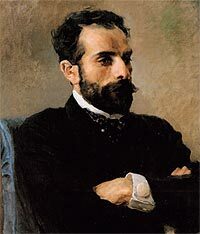 "The import and significance of every true, great artist consists in the irresistible appeal of his personality and in how it reflects in his artwork", wrote Leonid Pasternak in a memoir about Isaac Levitan. The originality of Levitan as an artist lies in his being a natural, entirely self-sufficient landscape artist who fully realized his talent in landscape art. His landscapes eclipsed all his forays into different genres and creative activities. 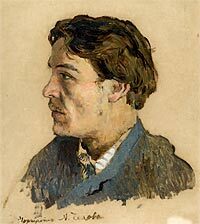 Who remembers now that Levitan illustrated magazines and books, designed stage sets, created portraits and still-lifes? 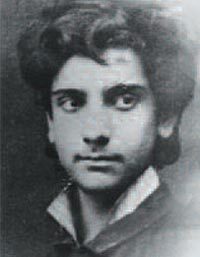 August 18 (by the Old Style, 30): Born into the family of a railroad employee Ilya Abramovich Levitan in Kibarty (today Kibartai village in Lithuania). In June 2010 the town of Plyos marked its 600th anniversary. 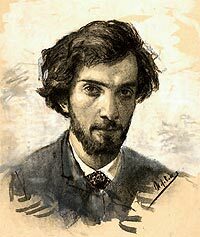 50 years ago, in 1960, the day for the festivities was set on August 30, which coincided with the centenary of the birth of Isaac Levitan, the illustrious landscape artist. Many artists from Moscow and the city of Ivanovo responded to the artist Boris Prorokov's call to donate their paintings to Plyos. The new picture gallery, an establishment operated on pro bono basis, was opened in 1961; initially it was accommodated at a Plyos agricultural college, on Sobornaya Hill, in a building which before the revolution was occupied by a governmental agency. Later, in 1962, the gallery moved to the Voskresensky church near Torgovaya Square, not far from a boat quay. 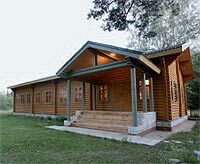 A landmark event happened on August 23 2008 in the village of Eliseikovo, in the Petushinsky District near Vladimir - the Levitan House of Landscape opened. The exhibition "Russian Artists Abroad. 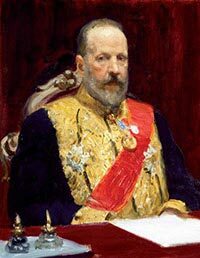 Marianne Werefkin (1860-1938)"'opening at the Tretyakov Gallery, is a part of the Ticino Year in Russia - the year dedicated to the Swiss canton of Ticino in Russia - and is timed to coincide with the 150th anniversary of the artist's birth. Regrettably, the general public in Russia knows little about Marianne Werefkin, although she is a fascinating personality in many respects. 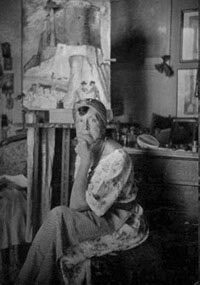 Some viewers will be more interested in her evolution as an artist - from her "Peredvizhniki"-style realism, through symbolism and other schools that nearly all artists of her age engaged with, towards a very distinctive, idiosyncratic expressionism. Others will probably take an interest in her life story, so unusual for a 19th-century woman, including many dramatic turns of fate, and resolute decisions taken in the course of it. The summer exhibition “Miró. The Colours of Poetry” at the Museum Frieder Burda (2 July to 14 November 2010) is dedicated to the artist Joan Miró, and shows around 100 works by the Catalan artist who so strongly influenced 20th century art. The pictures cover six decades of Miró’s work, and are drawn from various private collections and museums from all over the world. 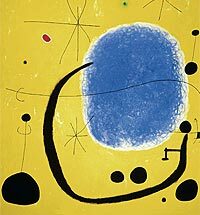 A large number of works owned by the Miró family itself are shown as well, a rarity in itself, while others come from the Fundació Joan Miró in Barcelona and Palma de Mallorca. The exhibition was curated by the worldwide expert on sculpture Jean-Louis Prat, a close friend of Miró who organized exhibitions for him during his lifetime, while the artist’s grandchild Joan Punyet Miró attended its opening. 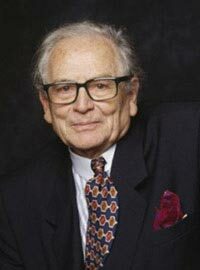 I am greatly pleased to pioneer in the Tretyakov Gallery Magazine the section “Pierre Cardin Presents”, introducing my projects in which theatre, ballet, opera, dance, visual and applied arts, and fashion perfor-med spotlessly and solo are combined to achieve a synthesis that is the thing of the future.